As part of some new changes on the SMEStorage web platform (more of those in the next post) we have introduced contacts as data that you can back up to the cloud platforms we support. Once your contacts are imported (and you can back them up to any cloud that we support (which includes Amazon S3, Mosso Cloud Files, Box.net, Gmail-as-a-Cloud, Email-as-a-Cloud, FTP-as-a-Cloud, MobileMe, and any WebDav enabled cloud) they are stored as VCard files, and as they are treated as files you can mark them as favourites, share them over email, or Twitter etc. 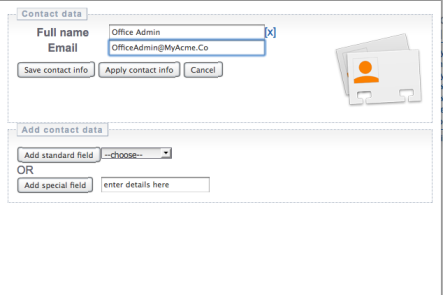 Once your contacts are imported you can create contact groups and sub groups and organise your contacts. All your contacts and contact groups are integrated into the site so if you want to share files over email or from business groups when you start typing the first letters your contacts will popup for your to insert.